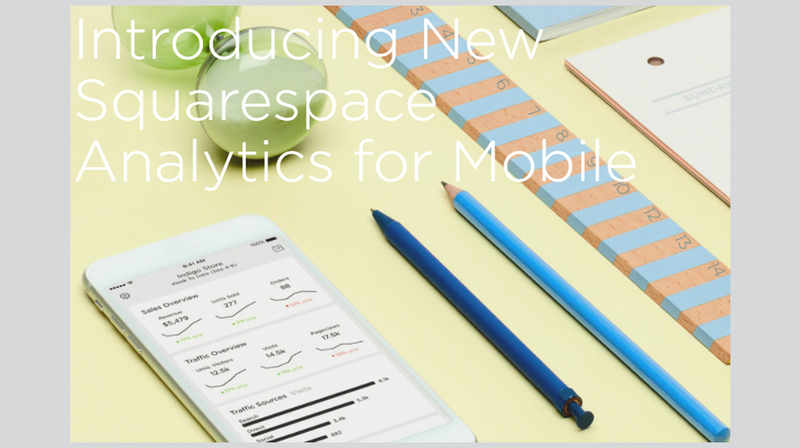 The redesigned mobile analytics platform from Squarespace gives you valuable insights into your website so you can make informed decisions about your small business. The new Squarespace Analytics app delivers a range of metrics about your website on your iOS and Android mobile device. You can access the information any time no matter where you are by using the desktop analytic capabilities. Because of the way digital technology is used by small businesses, business intelligence and big data analytics are no longer the domain of just large organizations. Analytics and business intelligence give your small business tremendous growth opportunities in today’s digital ecosystem. This is because data is being continuously generated across your website, social media channels, email, ecommerce and more. If the data is properly managed with the right analytics and business intelligence solutions, the insights you gain will be invaluable. The app has been redesigned with a new interface for a smaller screen without sacrificing functionality. You can customize views and date ranges so you can see how your site is performing in the different metrics it measures. Traffic Sources measures how your marketing is impacting website traffic and revenue. Activity Log, on the other hand, gives you insights by providing information about website visitors, which also includes their location and site path. When it comes to keeping tabs on sales metrics, Top Products lets you see which of your items are best-sellers by revenue. The Sales Overview then compares the trends of the sales of your business from past dates. If you want to delve even deeper into the sales process, Purchase Funnel allows you to track everything from visits to purchase through every step of the funnel. Many small businesses wrongly assume big data analytics or business intelligence technologies don’t apply to them. But companies of all sizes now operate entirely or in great part in a digital ecosystem. This means you, your business, and customers will be generating a lot of data. The sooner you analyze this information and use the insights it provides, the sooner you will introduce new levels of efficiency to your business. The Squarespace mobile analytics app is one such tool.